Anwar El-Sadat, Chairman of Reform and Development Party, stated that he is deeply concerned about the current economic situation of Egypt especially in light of a global deterioration driven by the slowdown in China and the decrease in oil prices that affects our Gulf partners. Such developments contribute to the loss of regular sources of foreign currency. The severe depletion of our foreign currency reserves is pushing traders to resort to black markets, which pressures down the pound to unprecedented levels. Meanwhile, the government is trying to sort a way out for such a structural problem by continuing to borrow from the World Bank and other international funds without having any guarantees to make the situation better. The root cause of this crisis is that we simply import double what we export. Therefore, the question is: what happens after we deplete all the loans we can receive, and come back to square one. Are we going to put an end to that vicious circle? What can we do to attack the roots of the crisis? There is no doubt that we have to courageously face the facts and be frank with ourselves. El-Sadat highlighted that other nations that faced similar situations had to deal with international lending institutions, Greece as the latest example. It was apparent that international funds was ready to fund the economy in peril with low-interest, multi-billion dollar rescue plans to protect the economy from collapse. However, the terms and conditions were very severe and difficult to swallow. It seems that eventually we have no other option but to resort to such institutions and establish partnership with them. Nevertheless, we will have to enact severe measures such as sharply devaluing our currency, complete lifting of fuel subsidies, wide-scale privatization, more taxes, etc. 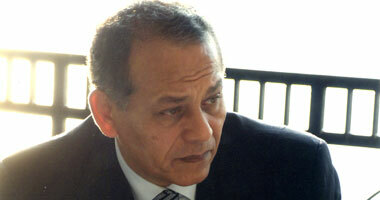 Such measures will negatively affect a wide range of Egyptian households. Indeed, our resistance to such necessary structural reforms may lead to further deterioration of the situation. Hence, all of us must take responsibility and bear the effects of these actions that seem inevitable no matter how long the time. In addition, we need to intensify the efforts and increase production and improve the Egyptian product in order to be able to compete with foreign products and thus increase our exports and go back to a safe economic territory where we need no more loans or donations. Finally, Sadat is advising President-Sisi to take advantage of his significant popularity and frankly speak to the Egyptians on the current situation and the tough measures we have to enact to attain a better future. We are quite worried that hesitation in that matter may cause further economic deterioration and concurrently a depletion of Sisi's popularity, and then it will probably be too late to fix anything. 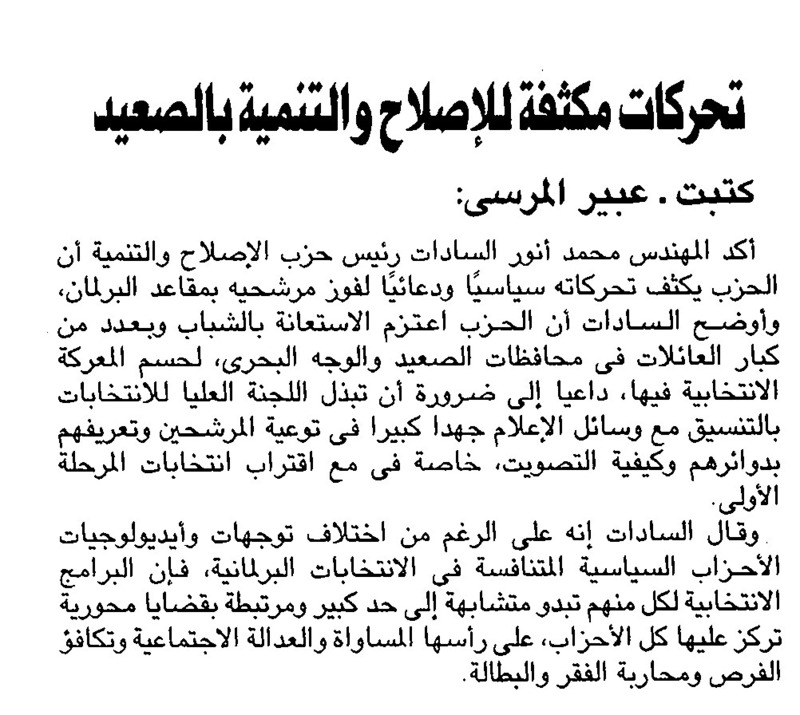 Anwar El-Sadat, Head of Reform and Development Party was astonished from the declarations made by Dr. Hussam Mughazy, minister of Irrigation to the weekly newspaper Almassa' . The Minister stated that all data related to the Nile River issue should be kept classified and should only be revealed to experts and specialists in the field claiming that it affects homeland national security. El-Sadat stressed that the Minister instead of clarifying frankly to the Egyptians the situation of Al-Nahda Dam and its effect on the share of the Egyptians from the Nile, he kept all the information classified. The Egyptians may help in facing such problem by wisely using water and making the utmost usage of it. This act of keeping information secret is considered to be counter Article 44 of the Egyptian constitution. El-Sadat called President Sisi for urging the government to reveal to the Egyptians the facts about the Nile and our water challenges. The future prospects of any project related to the Nile is of paramount importance to all the Egyptians, and hence, it should be protected and preserved by them hand in hand with the Egyptian government. صرح محمد أنور السادات، رئيس حزب الإصلاح والتنمية، أنه يشعر حاليا بقلق عميق تجاه الوضع الاقتصادي لمصر والذي أصبح ظاهرا بوضوح انه دخل في مرحلة حرجة ويأتي ذلك بالتزامن مع بداية موجة ركود عالمية مدفوعة بتراجع النمو في الصين وكذلك ازمة اقتصادية خليجية مدفوعة بتراجع حاد وطويل المدى لأسعار البترول، وهو ما يؤدي الى فقدان مصر موارد تقليدية للعملة الصعبة. وتابعنا في الايام القليلة الماضية القفزات المتواصلة في سعر الدولار سواء في البنوك او السوق السوداء ناشئة عن التراجع الخطير للاحتياطي الاجنبي، بالتزامن مع تحركات حكومية لعلاج الخلل الهيكلي في موارد العملة الصعبة بالتوسع في الاقتراض من البنك الدولي والتنمية الافريقي واستنزاف حصة مصر الائتمانية لدى هذه المؤسسات دون أي ضمانات لعلاج الخلل الجوهري والذي تسبب في هذه المأساة الاقتصادية وهو اننا ببساطة نستورد من العالم ضعف ما نصدر. فماذا بعد ان نستنزف هذه التسهيلات والقروض ونعود مرة أخرى بعد شهور قليلة الى نقطة الصفر لنبحث عن تمويل طارئ جديد وتستمر الحلقة المفرغة بلا نهاية. فماذا نفعل لكي نصلح المشكلة من جذورها؟ لا شك اننا الان أمام خيارات صعبة ومصيرية وعلينا ان نقف بشجاعة ونواجه أنفسنا بحقائق وضعنا الاقتصادي . وأوضح السادات أن تجارب الدول التي مرت بأزمات مماثلة واقربها اليونان تبين بصراحة ان مؤسسات التمويل الدولية ليس عندها مانع من الإقراض وحماية تلك الاقتصادات من الانهيار وأنها قدمت مئات المليارات من القروض بفائدة منخفضة جدا، ولكن في المقابل بشروط صعبة جدا أيضا. يبدو انه لا خيار لدينا حاليا سوى التوجه نحو تلك المؤسسات والشراكة الطويلة المدى معها، ولكن سيكون علينا ان نتخذ إجراءات قاسية منها خفض حاد في سعر الجنيه امام الدولار، وإلغاء تام لدعم الوقود، وخصخصة جزء كبير من الشركات العامة، وفرض مزيد من الضرائب وغير ذلك من الإجراءات التي لها تأثير على قطاع كبير من المواطنين. ان مقاومتنا للإصلاحات الهيكلية الضرورية ربما تؤدي لمزيد من تدهور الوضع، وبالتالي فعلينا جميعا ان نتحمل المسئولية ونواجه آثار هذه الإجراءات التي تبدو حتمية مهما طال الوقت بتكثيف الجهد وزيادة الإنتاج وتحسين المنتج المصري كي يستطيع ان ينافس المنتج الأجنبي ويتفوق عليه وبالتالي يزيد ما نصدره للعالم عما نستورده ونعود الى وضع آمن للاقتصاد نتخلى فيه عن احتياجنا للمنح والقروض والتمويل الطارئ . وأخيرا، وجه السادات النصيحة للرئيس السيسي ان يستغل شعبيته المؤثرة وحب ملايين المصريين له وايمانهم بإخلاصه في مصارحة الشعب بحقائق الوضع الصعب والخيارات التي علينا اتخاذها لنجتاز هذه الظروف نحو المستقبل الأفضل، ونخشى ان يتسبب التردد في هذا الامر الى مزيد من التدهور الاقتصادي واستنزاف شعبية الرئيس في ذات الوقت، وساعتها لن ينفع الندم. دعا أ/ محمد أنور السادات " رئيس حزب الإصلاح والتنمية " المصريون فى الخارج الى الخروج للإدلاء بأصواتهم الانتخابية فى جولة الإعادة التى تجرى حاليًا فى الدول العربية والأجنبية. مناشدا السفارات المصرية بالخارج وأعضاء وممثلى اتحادات المصريين فى الخارج، ورؤساء وأعضاء الجاليات والروابط والأندية والاتحادات الفرعية إلى توفيركافة سبل الدعم للناخبين للإدلاء بأصواتهم. أكد السادات على أنه لا يصح أن تفتح السفارات والقنصليات المصرية أبوابها فى ١٣٩ دولة ولمدة يومين لتسهيل عملية الإقتراع ولا نجد نسب مشاركة مشرفة والمعروف للجميع أن المصريون في الخارج دائما يضربون المثل والقدوة والنموذج فى الانتماء وحب الوطن ويشهد على ذلك مواقفهم ومشاركتهم في الإستحقاقات التي مضت. أوضح السادات أن هناك أخطاء أدت إلى انخفاض نسبة مشاركة المصريون بالخارج في الانتخابات وعلى رأسها عدم المعرفة بالمرشحين وبرامجهم مقارنة بما حدث في الاستحقاقات الماضية حيث استطاع الناخب فيما مضى تحديد مرشحه والاختيار بين عدد قليل جدا من المرشحين. 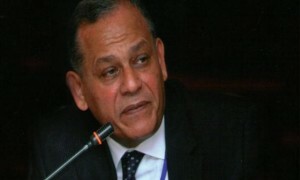 The Reform and Development Party under the leadership of Mr. Mohamed Anwar Sadat related the instability of the first phase parliamentary elections to the incorrect policies. Such instability is sensed internally and abroad. Many electors abstained from voting leading to bringing elections upside down. 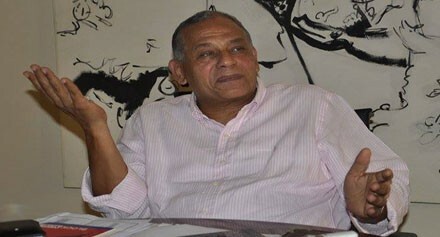 El-Sadat stressed that voters' reluctance has led to the loss of efforts exerted by party candidates and supporters and to the absence of the spirit of competition. It further promoted a feeling among voters that what is made by the new nominees will not be much different from what was made by their predecessors. That led to failure of new and old party candidates to be represented in the early first phase of elections. 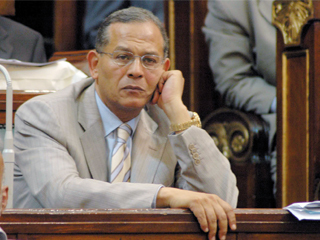 El-Sadat said that there are many reasons the State should be held liable for that lead to the lack of parliamentary importance. The reasons, inter alia, are that the parliament impedes the president and the development plans; and that the elections were postponed more than once; and that the constitution will be amended. Such issues made a lot of people consider elections impeding the progress of the state. Thus, the parliament is deemed important abroad rather than internally and it thus lacks representing most of the Egyptians. 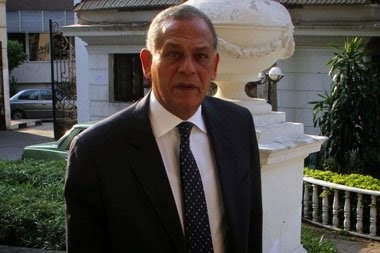 Anwar El-Sadat, the head of the Reform and Development Party (RDP) calls the state agencies concerned to address immediately the reasons for the reluctance of voters to participate recently in elections and constitutional merits. Such reluctance reflects a serious indication that numerous Egyptians start losing interest in the political situation and that most people will stay at home resembling a pre-January 25 Revolution scenario. 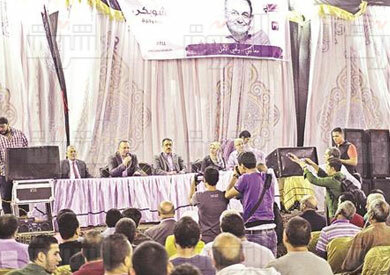 El-Sadat emphasized the importance of considering the reasons for this reluctance to work immediately on the development of awareness and urging voters to participate in the House of Representatives elections. The drawbacks must be addressed, especially the acts of media; repetitive postponement of the elections; the bona fide' parliament; the constitution amendments; the obstacles set by the parliament to the President; and the development plans in addition to the aging of leaders and non-renewal of the elites and the futility of political parties' work. El-Sadat highlighted the importance of accelerating the processing of addressing such drawbacks that led to such reluctance, especially that the second phase elections is soon. If such drawbacks are not addressed swiftly, our image before ourselves and the whole world will be negatively affected. أرجع حزب الإصلاح والتنمية برئاسة أ/ محمد انور السادات ارتباك المشهد الانتخابى الذى شعر به الجميع فى الداخل والخارج مع بداية المرحلة الاولى من انتخابات البرلمان الى سياسات الدولة الخطأ التى تجلت اثارها بوضوح فى العزوف الكبير للناخبين عن المشاركة واصرارهم على عدم الخروج للإدلاء بأصواتهم فى الانتخابات الامرالذى قلب موازين العملية الانتخابية رأسا على عقب. وأكد السادات أن عزوف الناخبين عن المشاركة أدى الى ضياع جهد مرشحى الحزب والداعمين لهم وغياب روح التنافس بل وتنامى الشعور لدى الناخبين بأن ما سيقدمه الوجوه الجدد من المرشحين لن يختلف كثيرا عما قدمه من سبقوهم مما أدى الى إخفاق مرشحى الحزب والأحزاب قديمة وحديثة النشأة فى الحصول على مقاعد وتمثيل جيد في أولى مراحل العملية الانتخابية. أوضح السادات أن الانطباع الذى تم الترويج له عن البرلمان وتعطيله للرئيس وخطط التنمية والتأجيل المتكرر للانتخابات والحديث عن تعديل الدستور وغيرها من الأسباب التى تتحمل الدولة مسئوليتها جعل للأسف البرلمان عديم الأهمية فى نظر الكثيرين واعتبروه خطوة لعرقلة مسارالدولة فأصبح وجود البرلمان أهم خارجًيا اكثر منه داخلًيا وبالتالي لم يعد البرلمان بمرشحيه يمثل كثيراً لدى اغلب المصريين. دعا أ/ محمد أنور السادات " رئيس حزب الإصلاح والتنمية " أجهزة الدولة المعنية بضرورة الوقوف فورا على أسباب عزوف الناخبين عن المشاركة في الانتخابات والإستحقاقات الدستورية مؤخرا بشكل يعكس مؤشرا خطيرا يتمثل في عودة كثير من أبناء الشعب المصرى بمختلف فئاتهم وأعمارهم إلى عدم الاهتمام بالوضع السياسي ومستقبل الوطن على شاكلة ما قبل ثورة 25 يناير. أكد السادات على أهمية بحث أسباب هذا العزوف والعمل فورا على تنمية الوعي وحث الناخبين علي المشاركة في انتخابات مجلس النواب ومعالجة آثار ما وقعنا فيه من أخطاء أدت إلى هذا المشهد المؤسف وعلى رأسها الآداء الإعلامى والتأجيل المتكرر للإنتخابات والحديث عن برلمان النوايا الحسنة وتعديل الدستوروتعطيل البرلمان للرئيس وخطط التنمية بجانب شيخوخة الزعامات وعدم تجديد النخب وعقم العمل الحزبي. أوضح السادات أهمية الإسراع في معالجة هذه الأخطاء وغيرها وكل ما أدى إلى هذا العزوف خاصة وأن لدينا قريبا انتخابات بمحافظات المرحلة الثانية وهذا المشهد الذى نحن بصدده الأن مالم يتم التعامل مع أسبابه سريعا سوف تكون المشاركة هزيلة للغاية وهو ما سوف يؤثر سلبا على صورتنا أمام أنفسنا وأمام العالم. 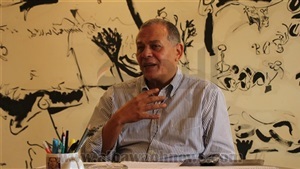 Anwar El-Sadat, Head of Reform and Development Party (RDP) expressed his concern about the successive events taking place recently. Such events denote that we may be undergoing an economic crisis. Mr. Sadat suggests that we may resort to taking unexceptional extraordinary severe measures to overcome this situation. Reserve currency has dropped to $ 16.3 billion, which is almost equivalent to the size of the Gulf central bank deposits. 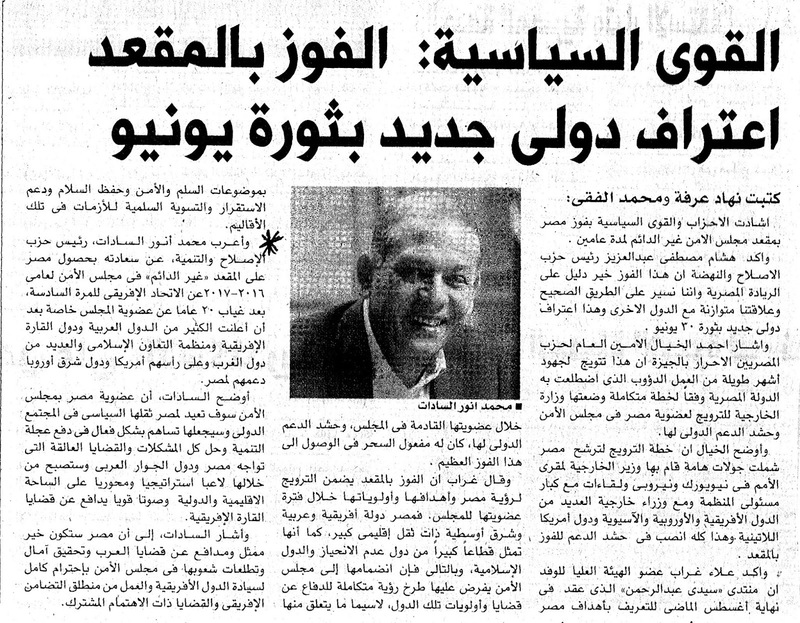 It barely covers Egypt's imports for three months. This, with an unexpected drop in the revenues of the Suez Canal, would lead to new black market dealings for dollars. On the other hand we witness government actions: borrowing $ 3 billion from the World Bank; selling lands for expats; and raising customs on dozens of goods. This would have an impact on prices of goods and services in addition to the issue of support, amid the absence of a clear vision for the near future which raises concern to all segments of society and puts obstacles in front of rate high growth to achieve the aspirations of young people and the poor. Based on all that, Mr. Sadat, calls upon President Sisi to explain to the people who elected him and stood behind him in front of terrorism and gave him confidence in the leadership of the country at this difficult stage, the facts and details of the economic crisis and the real causes and to determine who is responsible for this situation and to explain to the people honestly his plan to overcome this crisis and to develop indicators upon which delinquents will held accountable. Mr. Sadat explained that Sadat that the parliament, which will be held soon should prioritize the economic issues on its agenda as it affects all classes of people. 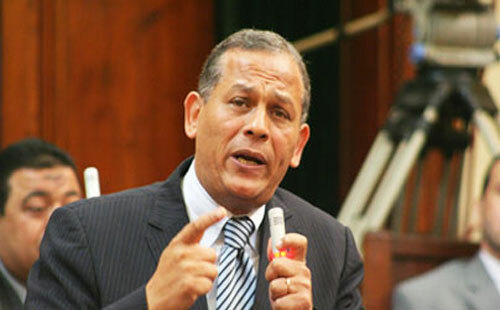 He adds that the parliament should monitor the government agencies and draft legislations needed for the upcoming stage. أعرب محمد أنور السادات، رئيس حزب الإصلاح والتنمية، عن قلقه البالغ تجاه الانباء المتتالية خلال الأيام الماضية والتي توحي بأننا قد نكون في مأزق اقتصادي وأن علينا اتخاذ إجراءات استثنائية وصعبة لتجاوز هذا الوضع. وتابع السادات، في تصريح صحافي له اليوم، انخفض الاحتياطي من العملات الى مستوى 16.3 مليار دولار وهو تقريبا يعادل حجم الودائع الخليجية بالبنك المركزي وبالكاد يغطي واردات مصر لمدة ثلاثة شهور، مع عودة جديدة للسوق السوداء للدولار، مع انخفاض غير متوقع في عائدات قناة السويس. وأضاف السادات، نرى تحركات حكومية لاقتراض 3 مليار دولار من البنك الدولي وبيع أراضي للمغتربين ورفع الجمارك على عشرات من السلع وتأثير ذلك على أسعار السلع والخدمات وقضية الدعم، وسط غياب رؤية واضحة للمستقبل القريب قبل البعيد وهو ما يثير قلق جميع فئات المجتمع ويضع عوائق امام معدل نمو مرتفع يحقق طموحات الشباب والفقراء. و طالب أنور السادات الرئيس السيسي بالخروج الى الشعب الذي انتخبه ووقف ورائه امام الإرهاب واعطاه الثقة في قيادة البلاد في هذه المرحلة الصعبة وأن يصارح الجماهير بحقائق وتفاصيل الازمة الاقتصادية وأسبابها الحقيقية ويحدد من المسئول عن وصول مصر لهذا الوضع وأن يوضح للشعب بصراحة خطته لعبور هذه الازمة وان يضع مؤشرات لكي يحاسب عليها المسئولين. أعرب أ/ محمد أنور السادات " رئيس حزب الإصلاح والتنمية " عن تفاؤله بحصول مصر على المقعد "غير الدائم" فى مجلس الأمن لعامى 2016-2017عن الاتحاد الإفريقى للمرة السادسة، بعد غياب 20 عاما عن عضوية المجلس خاصة بعد أن أعلنت الكثير من الدول العربية ودول القارة الإفريقية ومنظمة التعاون الإسلامي والعديد من دول الغرب وعلى رأسهم أمريكا ودول شرق أوروبا دعمهم لمصر. أوضح السادات أن عضوية مصر بمجلس الأمن سوف تعيد لمصر ثقلها السياسى في المجتمع الدولى وسيجعلها تساهم بشكل فعال في دفع عجلة التنمية وحل كافة المشكلات والقضايا العالقة التي تواجه مصر ودول الجوار العربى وستصبح من خلالها لاعب استراتيجى ومحورى على الساحة الاقليمية والدولية وصوت قوى يدافع عن قضايا القارة الإفريقية. أشار السادات إلى أن مصر ستكون خير ممثل ومدافع عن قضايا العرب وتحقيق آمال وتطلعات شعوبها في مجلس الأمن بإحترام كامل لسيادة الدول الأفريقية والعمل من منطلق التضامن الإفريقى والقضايا ذات الاهتمام المشترك خاصة وأن مصر لها تجارب سابقة ولعبت دورا تاريخيا في دعم الثوابت التى يقوم عليها ميثاق الأمم المتحدة وقضايا حقوق الانسان، والتنمية الشاملة وكذلك فى تأسيس منظمة الأمم المتحدة، وسيكون لعضوية مصر بمجلس الأمن دورا كبيرا في محاربة الإرهاب وآثاره في المنطقة العربية. قال محمد أنور السادات، رئيس حزب الإصلاح والتنمية، إن وجود عدد كبير من نواب الحزب الوطني المنحل في مختلف الدوائر الانتخابية على مستوى الجمهورية أصاب الشباب باليأس. مؤكدًا أن هذه المظاهر هي التي جعلت بعض المواطنين يعتقدون أنه لا جديد في الحياة السياسية أو في الشأن العام. قال محمد أنور السادات، رئيس حزب الإصلاح والتنمية، إن نظام القوائم المغلقة تسبب في انشقاقات وخلافات كبيرة بين الأحزاب السياسية التي دفعت بمرشحين لمجلس النواب. وأضاف السادات بأن هناك ما تردد مؤخرًا عن قائمة "في حب مصر" وأنها محظوظة نظرًا لتلقيها دعمًا إعلاميًّا وهو ما أثبته حرص شخصيات بارزة على الانضمام لها، مؤكدًا على ضرورة وجود تحقيق معلن لتوضيح حقيقة الأمر. يخوض محمد انور السادات النائب البرلماني السابق ورئيس حزب الإصلاح والتنمية انتخابات برلمان 2015 كمرشح فردي عن دائرة السادات بالمنوفية، ويعتبر السادات من رؤساء الأحزاب الذين لا يصارعون لخوض الانتخابات من خلال القوائم نظرا للشعبية التي يتمتع بها بالدائرة بل وبالمحافظة اكلمها نظرا للجهود التي تقوم بها مؤسسة السادات الخيرية. صرح السادات بان هناك ارتباكا يسيطر على المشهد الانتخابي من المال السياسي واستغلال اسم الرئيس في الدعاية الانتخابية فضلا عن الغموض الذي يسيطر على بعض القوائم الانتخابية. المشهد مرتبك جدا وملامح ذلك في عدة جوانب أولها فيما يخص القوائم، فهناك قوائم انتخابية تم قبولها وأخرى رُفضت،وقوائم نجحت في بعض القطاعات، وأخرى ما زال ينظر فيها أمام المحاكم الإدارية، وفي كل الأحوال الجميع ينتظر بدء المرحلة الانتخابية ولا بد من تحقيق مشاركة قوية من قبل المواطنين، الذين بدورهم لا بد وأن يدركوا أن المشاركة واجب عليهم سواء كانوا راضين عن الأوضاع أو غير راضين أيا كانت الاختيارات. وثانيها لا بد أن نذكر أيضا أن هناك جانبا مهما تم تجاهله وهو توعية المواطنين بعملية الاختيار فطبقا لقانون تقسيم الدوائر الجديد،هناك دوائر سوف يتم تمثيلها بأربعة مقاعد وخرى بمقعدين والناخب لا بد أن يعي ذلك حتى لا يكون هناك نسبة الأصوات الباطلة كثيرة. وثالث الأمر هو حملات المرشحين التي نري بها مبالغات كثيرة من حيث الإنفاق، المال السياسي به بذخ سواء للقوائم والفردي وانا اري أن اللجنة العليا للانتخابات والجهاز المركزي للمحاسبات لابد أن يأخذ هذا الأمر في الاعتبار للحفاظ على شرعية وشفافية العملية الانتخابية. هذا واقع،هناك بالفعل قوائم سرقت اوراق مرشحيها في مختلف القطاعات وهذا يجب أن يكون محل تحقيق من قبل الجهات المسئولة لتقديم المخطئ والمتسبب في ذلك إلى محاكمة. أنا أرى أن هناك حالة من العزوف من قبل المواطنين للمشاركة في الحياة السياسية وهذا الأمر له ظروف متعددة أولها البعض لديه تحفظ على بعض السياسيات والقرارات. واخرون يعتقدون اننا نعيش فترات الشعب ثار عليها على مدى أربعة أعوام ومنها عودة بعض رجال النظام القديم من الحزب الوطني واخرين شعروا انهم لم يعد لهم دور في الوضع السياسي الجديد فضلا عن تسرب اليأس إلى روح الشباب والذين انصرفوا عن الاهتمام بالعمل العام. ولكن الاهم الآن أن يتم طمأنة المواطنين أن الطريق طويل، البرلمان المقبل سوف يسهم في ذلك من خلال اختيار عناصر مؤهلة تستطيع القيام بهذا الدور. اعتقد أن النسبة لن تزيد عن 40 % وهناك شواهد تؤكد ذلك وهي انتخابات نقابة الأطباء والتي أصابتنا جميعا بصدمة التي لم تتعد نسبة المشاركة بها إلى 6 بالمائة وهو على مستوى النقابة العامة وعلى مستوى اللجان الفرعية بالمحافظات. حقيقة أن أحزاب ما بعد الثورة استعانت بعدد كبير من نواب الحزب الوطني المنحل للدفع بهم في مختلف الدوائر الانتخابية على مستوي الجمهورية وهذا حق لهم طالما لم يوجد عزل قانوني أو بحكم قضائي، وأعتقد أن هذه المظاهر هي التي جعلت بعض المواطنين يعتقدون أنه لا جديد في الحياة السياسية أو في الشأن العام. ثورة 25 يناير كان لها أثر كبير في نفوس المصريين ومنها إزاحة الخوف من قلوب المصريين ولكن الطريق طويل لكي نستكمل البناء المؤسسي وإصلاح المؤسسات من الفساد والذي اصبح حاجة ملحة وضرورية، ولكن هناك إشكالية كبيرة وهي أن الدستور 2014 لم يقص احدا إلا بحكم قضائي. فبعض رجال الحزب الوطني يخوضوا انتخابات البرلمان وآخرين موجودين حول الرئيس وهو ما جعل البعض يتساءل لماذا قامت ثورة 25 يناير. الفساد في مصر استشري حتى اصبح مؤسسة قائمة بذاتها ولن نستطيع القضاء عليه في يوم وليلة ولكنه يحتاج إلى حوار مجتمعي وتحقيق المساواة والعدل ومبدا تكافؤ الفرص وهو تحد كبير واعتقد أن الدولة الآن جادة في محاربة الفساد وهناك بعض الظواهر وربما ساعد البرلمان المقبل في استكمال هذه المسيرة إذا توافر تأييد شعبي. من الصعب الحكم على بينة البرلمان المقبل الآن وهو حديث يردده بعض المتشائمين من البرلمان المقبل ولكن حتى وان كانت البشائر غير مطمئنة بسبب اسماء المرشحين في بعض الدوائر أو القوائم ولكن أنا أعتقد أن تواجد 100 عضو فقط في البرلمان ممن يتمتعون بفكر وثقافة قادرة على احداث حراك لدى باقي الأعضاء. الدستور- رغم الجهد الذي بذل فيه- إلا إنه من وجهة نظري يحتاج إلى إعادة نظر لأن الحالة التي كتب فيها الدستور عقب ثورة 30 يونيو والاستعجال دفعتنا إلى اختيار اشخاص لا ينبغي على الإطلاق أن يكتبوا دستور مصر. ولكن في جميع الأحوال، اغلب مواد الدستور لم تطبق بعد لأننا لم نمارس مواد الدستور وبالتالي من الصعب الحكم عليها ولكن قد تتضح عيوب هذه المواد عقب ممارسة الدستور وانتخاب البرلمان ومن ثم فان هناك اليات محددة حددها الدستور لتعديل هذه الأمر ولكن قبل ذلك لا يحق لنا الحديث عن مواد الدستور نهائيا لأن هناك أولويات لا بد من النظر إليها. المواد التي تحتاج إلى تعديل لا تتعلق بالسلطة، وإنما تتعلق بالعدالة الاجتماعية والنسب التي تم تحديدها للصحة والتعليم فضلا عن وسائل اعتماد الموازنة العامة. محمد أنور عصمت السادات، مؤسس حزب الإصلاح والتنمية، وابن شقيق الرئيس الراحل محمد أنور السادات، ورجل سياسي وبرلماني مخضرم. وفي حوار أجرته معه شبكة الإعلام العربية «محيط»، أجاب السادات على العديد من التساؤلات والقضايا الشائكة وتوقعاته لشكل البرلمان القادم والتحالفات التي يمكن أن تشهدها قاعات المجلس. وتحدث أيضًا عن تأثير المال السياسي على العملية الانتخابية، وترشح فلول الوطني على بعض القوائم، وغيرها من الموضوعات التي تشغل الشارع السياسي..
الحزب انضم بالفعل إلى قائمة في «حب مصر»، وحصل على مقعدين بالقائمة، أحدهما في المنوفية بقائمة الدلتا لأميرة إبراهيم، والثاني في شمال سيناء التي يمثلنا فيها سلامة الرقيعي. ليس هناك سببًا محددًا؛ إلا أن تحالف الوفد الذي كنا جزءًا منه عندما اتخذ قرارًا بعدم الاستمرار، انضمت كل الأحزاب التي كانت في التحالف لقائمة في «حب مصر»، وهذا هو السبب.. وليست هناك أسبابًا أخرى. بصراحة شديدة ومن خلال المتابعة للعملية الانتخابية الكل اخترق مواعيد الدعاية الانتخابية والكل تجاوز، وللأسف الكل يروج للانتخابات بـ”السكر والزيت” إلى جانب اللحمة وشنط المدارس ورحلات حج وعمرة، والكل شاهد ويرصد ويوثق فالموضوع لم ينته بعد ولن ينته. الحزب يخوض الانتخابات المقبلة بحوالي ثلاثين مرشحين، لكني لا أتوقع أن تكون فرصته كبيرة في الحصول على عدد كبير من المقاعد. لسبب بسيط.. وهو أن أغلب مرشحينا يعتمدون على جهدهم وعلاقتهم وإمكانيتهم الشخصية المحدودة، مقارنة بنواب كثيرين يتم دعمهم من أحزاب لديها قدرة مالية كبيرة، وبالتالي فالمنافسة شرسة. الدعم الذي يقدمه حزبنا يتمثل في الدعم السياسي والمعنوي بالإضافة إلى دعم مادي محدود يتمثل في توفير جزء بسيط من مطبوعات الدعاية الانتخابية. وفقًا لتجاربنا السياسية السابقة ولما نراه على أرض الواقع خلال بعض الزيارات، فإن الانتخابات البرلمانية الحالية ستكون في غاية الصعوبة، خاصة في ظل انتشار «المال السياسي» والإمكانيات المادية الهائلة التي رصدتها مجموعة من الأحزاب والمرشحين المستقلين. اللجنة العليا للانتخابات وضعت قواعد وحددت سقفًا ماليًا لكل مرشح وكل قائمة، لكن الأهم أن ترصد وتتابع وتحاسب وتأخذ قرارات صارمة تصل إلى شطب المرشح. اللجنة العليا مسئوليتها محاربة المال السياسي وهناك قواعد تنظم الصرف المالي وهناك رقابة على أوجه الصرف من خلال اللجنة العليا بتكليف بعض من المحاسبين في الجهاز المركزي للمحاسبات وربما بعض مأموري الضرائب عن طريق متابعة الحسابات البنكية وأوجه الصرف ومظاهر الدعاية التي يرونها، فالمسألة ليست سهلة لكن قواعدها موجودة. لدينا مرشحون في المرحلة الأولى بالوادي الجديد وفي شبراخيت وكفر الدوار بالبحيرة والمنتزه بالإسكندرية ومغاغة بالمنيا ونصر النوبة بأسوان، فضلا عن اصغر مرشحي الحزب في دائرة طما بسوهاج. المرشحون جميعهم يلتزمون بخطة ورؤية الحزب والقضايا التي يتبناها، وللحق فإن هناك أمورًا ملحة. منها ما هو متعلق بسرعة تطبيق مواد الدستور لأن بها كل ما يتمناه كل حزب وكل مواطن إذا طبقت وفُعلت بشكل صحيح. فمثلا لو تحدثنا عن العدالة الاجتماعية أو الحق في العلاج على نفقة الدولة أو العملية التعليمية، فإن كل هذه الحقوق يكفلها الدستور.. ومن ثم تطبيق الدستور هو المنهج الرئيسي الذي يتبناه الحزب في المرحلة القادمة، ولو تبنى كل حزب تطبيق وتنفيذ ما تم الاستفتاء عليه في مواد في الدستور فإن ذلك سيكون كفيلًا بتحقيق أحلام المصريين. في تقديري أن قائمة «في حب مصر» سيكون لها النصيب الأكبر من المقاعد، بينما سينافس الآخرين على بقية المقاعد بكل شرف وجدية. لأن الواضح أن القائمة لديها قبول «شعبى».. ورغم ذلك فإن كل المفاجآت واردة، فمعروف أن مزاج الناخب المصري يتغير في يوم وليلة، ولذا دعنا ننتظر ونرى النتائج النهائية للانتخابات. لا اعتقد أن هناك ستكون أغلبية بالمعنى الحقيقي في هذا البرلمان، ربما تكون هناك أكثرية عددية فقط، لكنها في نفس الوقت لا تسمح بتشكيل الحكومة بمفردها، وفي الغالب سيكون هناك نسبة كبيرة من المرشحين المستقلين. وأتصور أن تكون هناك تحالفات سياسية من داخل البرلمان وليست من التحالفات الانتخابية، وقد تكون هذه التحالفات في شكل تحالف ليبرالي أو اشتراكي. كما أتوقع أيضًا من المستقلين أن يشكلوا تحالفًا خاصًا بهم داخل البرلمان، وهذا ليس بجديد وموجود في كل برلمانات العالم. لا.. سيكون هناك تمثيل لبعض الأحزاب الإسلامية، وعلى رأسهم حزب النور، ولكنه سيكون تمثيلًا محدودًا ولن يحصد المقاعد التي فاز بها في الانتخابات الماضية. لا أتوقع أن يكون هناك بعض المنتمين لجماعة الإخوان المسلمين.. وإذا حدث ذلك فلن يزيدوا على عدد أصابع اليد الواحدة.. سواء من كوادر التنظيم أو المتعاطفين والمؤيدين لهم. لا.. هذا غير حقيقي بالمرة، ومن خلال تجاربي السياسية لا أعتقد أن يكون هناك تحالف بين حزب النور وأي من بقايا الإخوان. لأن بين حزب النور وجماعة الإخوان “ثار بايت” وخلافات جوهرية، ومن يتحدث عن تحالفات بينهم لا يقرأ المشهد السياسي بشكل صحيح. نعم.. لكن أنا لا أعتقد أن يكون هناك تحالفات بينهم.. وربما سيصوتون لأشخاص معتدلين ولا أعتقد أنهم سيصوتون لأحد من أعضاء حزب النور.. فحزب النور لدية مشاكل مع قواعده شخصيًا وليس مع الإخوان فقط فقواعده نفسها منقسمة. هناك حملات تشن ضد الحزب، وعلى رأسها حملة «لا للأحزاب الدينية»، بالإضافة إلى وجود بعض الضغوط والتخوف بشكل عام من حزب النور والأحزاب الدينية..
نعم.. هي ” خطوة تكتيكية” أراد أن يعطي من خلالها رسالة للجميع بأنه لا يريد أغلبية في البرلمان القادم، فسحب قائمتين واكتفي بأخريتيين، بحيث تكون رسالة طمأنينة، وربما يكون قد نُصح من أحد بأن يقلل حدة الهجوم عن طريق سحب بعض قوائمه. ما زلت على رأيي بأن حزب النور مهما دفع بمرشحين فلن يحصد نفس حجم مقاعد 2012 كما يردد البعض، وما زلت أرى أن المواطن المصري ليس لديه استعداد أن يرى تجربة الإخوان تتكرر مرة أخرى. ”لسا قدامنا سنين”.. لأن ما تتحدث عنه هو الواقع المصري الانتخابي، ولابد على النظام الانتخابي أن يفرز المظاهر السلبية التي نراها في المراكز والقرى، ومثله ينطبق على ضعف الأحزاب المصرية في تراخيها وبعدها عن الشارع المصري، وبالتالي لدينا أشياء كثيرة تحتاج إلى إصلاح وتطوير. البرلمان القادم من المفترض أن يكون داعمًا للدولة لأن نجاح الدولة المصرية، حكومة ورئيسا، نجاح لأعضاء البرلمان جميعهم، وبالتالي فالبرلمان شريك أساسي في الحكم. يصحح المسار ويراقب ويراجع التشريعات التي صدرت وتحتاج إلى إعادة النظر فيها، ويصدر تشريعات جديدة طبقًا للدستور، بالإضافة إلى أنه يحتاج أيضًا أن يتحمل مسئوليته كبرلمان في التعامل مع العالم الخارجي، وتصحيح الصورة عن الأوضاع في مصر. فمن خلال البرلمانات المماثلة وما يطلق عليه «الدبلوماسية الشعبية» يستطيع أن يتحرك ويكون مؤثرًا لأنه برلمان منتخب يمثل الشعب، فالبرلمان علية دور كبير جدًا في خلق حالة من التوازن نحن في حاجه إليها في هذه الأيام ما بين الحكومة والشعب وباقي المؤسسات. هناك تشريعات كثيرة، قوانين متعلقة بالسلطة القضائية وبالإدارة المحلية وبالعدالة الاجتماعية، وهناك قضايا الأجور والمعاشات، بالإضافة إلى قوانين الجمعيات الأهلية والوظيفة العامة والتظاهر التي تحتاج إلى إعادة نظر فيها، إلى جانب قوانين أخرى تتعلق بالقضايا الاقتصادية وبعدم التمييز بين أفراد المجتمع وتكافؤ الفرص.. فهذه كلها قوانين يجب على البرلمان أن يبدأ بها. كنت أتمنى ألا يفكر أحمد عز في الترشح للبرلمان من الأساس وأن يتفهم أن الوضع صعب وغير مناسب.. إنما القضاء قال كلمته ويجب أن تحترم. جزء من الاستبعاد قانوني لأنه ما زال متحفظ على أمواله، وما زالت هناك قضايا منظورة ضده، وهذا كلام مقبول ومعقول، وجزء آخر سياسي، إذ إن أي قاضيًا ينظر بقضية عز سيضع في اعتباره ضرورة الحفاظ على السلام المجتمعي، ولابد وهو يصدر الحكم أن يراعي ضميره هذا الشخص «وجوده أو قبوله سيثير مشاكل وبلبلة في المجتمع»، ولذا فأنا اعتقد أن استبعاده من الانتخابات جزء منه قانوني وآخر سياسي ومعنوي وأدبي. بصرف النظر عما يتردد عنها والقضايا التي رفعت ضدها، كان ينبغي أن يسمح لها بدخول الانتخابات مادامت استوفت الشروط والأوراق سليمة وتم قبولها، ويتركوا الحكم في النهاية لكلمة الشعب.. لأن مسألة عدم توافر حسن السمعة تنطبق على آخرين ليس بالضرورة أن يكونوا من ” الراقصين أو المغنين”، وهؤلاء في تقديري يفعلون أكثر من الرقص وأكثر ضررًا على المجتمع. ماذا نفعل.. “الناس اخترتها هتعمل إيه دي رغبة الناس.. راقصة وربنا تاب عليها واتصلح حالها”. نعم.. لكن إذا كانت مواطنة ولديها حق وتريد أن تستخدمه في مباشرة الحق السياسي فماذا تفعل أنت أو أنا؟ وخاصة أننا رأينا على مدار المجالس السابقة نواب ” دعارة ومخدرات” ونواب “رشاوي”. لقد كانت هناك نماذج سيئة تمثل المجتمع للأسف على مدى البرلمانات السابقة، وبالتالي فالقضية بالنسبة لي أنه من حق أي إنسان أن يباشر حقوقه السياسية والمدنية، والشعب هو صاحب الكلمة الأخيرة. للأسف.. متواجدين في كل القوائم، لكني أؤكد مرة ثانية أن هذا حقهم طالما أنه ليس هناك إقصاء، وفقا للدستور، إلا بحكم قضائي.. وبالتالي لا تستطيع أن تمنع أحدًا من الترشح وممارسة حقه السياسي. نقطة مهمة جدًا وأنا قلق منها ومنزعج..المؤشر بالنسبة لي ما تم في انتخابات نقابة الأطباء التي فوجئت أن نسبة الإقبال فيها لم تتعد 15%، وهذه كارثة تجعلني متخوفا لأن انتخابات النقابات تمثل شريحة متعلمة ومثقفة في المجتمع، وهذا يدل على أن بعضهم “زهق” ومحبط وليس لدية ثقة في البرلمان لأسباب متعددة.. لكنني أتمنى من الجميع أن يتكاتف لتشجيع الناخبين ورفع معنوياتهم وتوعيتهم بأهمية المشاركة والتصويت في الانتخابات القادمة. لا اعتقد أنها ستكون نسبة كبيرة، وأكبر نسبة لمشاركة المصريين بالخارج ستكون في المنطقة العربية، ربما تكون هناك مشاركة في دول أوربية وفي أمريكا، لكني اعتقد أن الدول الخليجية التي يتواجد فيها المصريين بأعداد كبيرة ستكون نسبة المشاركة فيها ضئيلة. وعلى أية حال دعنا ننتظر فالمفاجآت واردة لأخر لحظة وربما نشهد نسبة إقبال كبيرة، ولذلك أطالب الرئيس السيسي بأن يدعو بنفسه المواطنين للمشاركة لأنه يلقى ثقة من شريحة كبيرة في المجتمع. قال محمد أنور السادات رئيس حزب الإصلاح و التنمية: إن الأحزاب اعترضت على قانون الانتخابات، ولكنهم اضطروا إلى الموافقة عليه، لأننا في حاجة لبرلمان . وأضاف السادات في مداخلة هاتفية بفضائية "المحور" اليوم الثلاثاء- أن هناك بذخا شديدا من قبل بعض المرشحين في الدعاية أكثر من تنظيم الإخوان، حيث إنه بدأ يأخذ أشكالا مختلفة مثل بناء مدارس وتوزيع لحمة ورحلات حج وعمرة. كما أشار رئيس حزب الإصلاح و التنمية إلي أن الساحة الانتخابية يسودها الآن تصفية الحسابات بين الأحزاب، لافتا إلي أنه من يملك المال سيكون له نصيب كبير من مقاعد البرلمان القادم . وأوضح السادات أن الهجوم على حزب النور مبالغة غير مقبولة، موضحًا أنه ليس بهذه القوة التي يتخيلها البعض، فعدد نوابه في البرلمان القادم لن يتجاوز 25 عضوا. وطالب رئيس حزب الإصلاح و التنمية بضرورة توعية المواطنين بالمشاركة في الانتخابات بالإضافة إلي أهمية البرلمان القادم. انتقد محمد أنور السادات، رئيس حزب الإصلاح والتنمية، الهجوم الذي تقوده بعض الأحزاب على حزب النور، فيما يتعلق بكونه حزب قائم على أساس ديني بما يخالف القانون. وقال «السادات» خلال مداخلة هاتفية لبرنامج «صوت الناس» الذي يعرض على شاشة «المحور»، الثلاثاء، إن هناك مبالغة في الهجوم على حزب النور، هو حزب قانوني مسجل وأصبح منافسا طبقا للقانون، ولا يجب التصعيد والهجوم عليه. وأضاف أن وصف حزب النور أنه يمثل «داعش» يهدد السلام الاجتماعي، مؤكدا أن تجربة الإخوان أثرت بشكل مباشر على حزب النور لأن المواطنين سيرفضون إعطاء صوتهم لأي حزب ديني. وتابع: «حزب النور ليس بقوة كبيرة ولن تزيد أعضائه عن 25 عضو في البرلمان، ومن حقه المنافسة ولو خرج عن القانون تنقطع رقبته». أكد أ/ محمد أنور السادات " رئيس حزب الإصلاح والتنمية " أن عضوية مصرالغير دائمة بمجلس الأمن والتي نترقبها جميعا سوف تجعل مصرمشارك أصيل وفعال في صنع القرار الدولى وحفظ السلم والأمن العالميين. ولاعب استراتيجى ومحورى على الساحة الاقليمية والدولية وصوت قوى يدافع عن قضايا القارة الإفريقية . أوضح السادات عضوية مجلس الأمن سوف تعيد لمصر ثقلها السياسى في المجتمع الدولى وسيجعلها تساهم بشكل فعال في دفع عجلة التنمية وحل كافة المشكلات والقضايا العالقة التي تواجه مصر ودول الجوار العربى. أشار السادات إلى أن مصرلعبت دورا رئيسيا في الدفاع عن قضايا المنطقة العربية ودورا تاريخيا في دعم الثوابت التى يقوم عليها ميثاق الأمم المتحدة وقضايا حقوق الانسان، والتنمية الشاملة وكذلك فى تأسيس منظمة الأمم المتحدة، وفى مجال حفظ السلم والأمن لذا فإن وجودها كعضو في مجلس الأمن سيكون له أثر بالغ ومردود جيد على الشرق الأوسط ككل..
اعتبر البرلماني السابق محمد أنور السادات أنَّ عضوية البرلمان لم تعد تدر نفعًا على المرشحين، قائلاً: "العملية نشفت خلاص، مفيش مكاسب من دخول من البرلمان زي زمان". وأضاف، خلال لقائه ببرنامج "الحياة اليوم" على فضائية "الحياة"، الأحد، أنَّ الوضع السياسي في البلاد في المرحلة الراهنة لا تتيح لأحد الحصول على امتيازات أو استثناءات من الحصانة البرلمانية، لافتًا إلى أنَّ عددًا من المرشحين يبحثون عن الوجاهة الاجتماعية من خلال عضوية البرلمان. وأشار السادات إلى أنَّ الحصانة البرلمانية لم تمنع في الوقت السابق محاكمة نواب ثبت تورطهم في قضايا فساد. قال محمد أنور محمد عصمت السادات رئيس حزب الإصلاح والتنمية، إن الوضع السياسي الحالى في مصر لا يتيح لأحد الحصول على امتيازات أو استثناءت من الحصانة البرلمانية، موضحا أن هناك من المرشحين من يبحث عن الوجاهة الاجتماعية من خلال عضويته في البرلمان. وأضاف خلال لقائه ببرنامج " الحياة اليوم " على قناة الحياة تقديم الإعلامية لبنى عسل أن الحصانة البرلمانية لم تمنع في السابق محاكمة نواب ثبت عليهم قضايا فساد، مشيرا إلى أن انتخابات نقابة الأطباء من يومين شهدت عزوف وعدم مشاركة من قبل الناخبين وهو يعد مؤشر خطير. وتابع، أن سيطرة الإخوان على النقابات المهنية انتهت وقاربوا على الاختفاء من المشهد السياسي، مضيفا أنه غير حقيقى ما يحاول أن يروجه البعض عن البرلمان المقبل من أنه سيكون برلمان " الموافقة " فقط. وأشار «السادات» إلى أنه لديه ملاحظات على حملات تجريح وتشويه وتخوين بعض القوائم، للقوائم المنافسة، مؤكدًا أن تصفية الحسابات أصبحت ظاهرة بين القوى السياسية وهو ما لا نريده في مصر الجديدة. قال محمد أنور محمد عصمت السادات رئيس حزب الإصلاح والتنمية إن مشاكل المواطنين كبيرة ومتراكمة موضحا أن الدولة ما زالت غائبة في كثير من القرى والنجوع التي تعانى نقصا كبيرا في الخدمات. وأضاف خلال لقائه ببرنامج " الحياة اليوم " على قناة الحياة تقديم الإعلامية لبنى عسل، أن النائب لن يستطيع تقديم أي خدمات لدائرته ما لم تدعمه الدولة، مشيرا إلى أن القوائم هي الطريق الأسهل لدخول البرلمان. وتابع، أن المرشح الفردى عليه ضغوط أكبر من أبناء دائرته بالإضافة إلى دوره الرقابى والتشريعى. قال محمد أنور عصمت السادات، رئيس حزب الإصلاح والتنمية، إن مظاهر الرشاوي الانتخابية توسعت خلال استعداد المرشحين للانتخابات البرلمانية، ولم تقتصر على تقديم الزيت والسكر للمواطنين فقط كما كان يحدث في الماضي. وأوضح «السادات»، خلال لقائه في برنامج «الحياة اليوم»، المذاع على «الحياة»، الأحد، أن هناك مرشحين وزعوا كشاكيل وكراسات على طلاب المدارس ووضع صورهم عليها، كما وزع آخرين شنط مدرسية تحمل صورهم أيضًا على التلاميذ لحث المواطنين على انتخابه، فضلا عن تقديم تيار الإسلام السياسي لخدمات في المراكز الطبية والمساجد والمدارس في الأحياء الشعبية كنوع من الدعاية لأنفسهم. وأضاف أن المرشحين من خلال النظام الفردي يقع عليهم ضغوط كبيرة وعبء أكبر من مرشحي القوائم الانتخابية، قائلا: «مرشحو الفردي (في وش المدفع) والناس ستطالبهم دومًا بتلبية احتياجاتهم وتوصيل صوتهم للحكومة». وتابع: «الدولة مازالت غائبة عن حل مشكلات العديد من المواطنين في القرى والنجوع والمحافظات المختلفة، ونواب البرلمان يشعرون بتقصير أيضًا تجاه المواطنين لعدم مقدرتهم على تلبية كل المطالب بسبب نقص الإمكانيات المتاحة». يذكر أن اللجنة العليا للانتخابات قد دعت، خلال مؤتمر صحفي، في شهر أغسطس الماضي، الناخبين المقيدة أسمائهم في قاعدة بيانات الناخبين للاقتراع في مقار اللجان الفرعية لانتخاب أعضاء مجلس النواب لعام 2015، وذلك على مرحلتين بدءًا من 17 أكتوبر وحتى 22 نوفمبر المقبل.